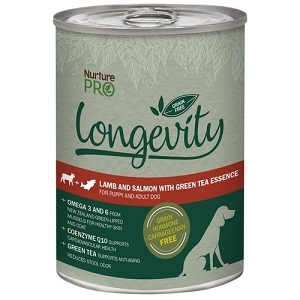 Made with pristine omega-rich New Zealand King Salmon, Longevity Salmon with Green Tea Essence is packed with natural sources of antioxidants and high amounts of EPA and DHA which are building blocks of a healthy brain. 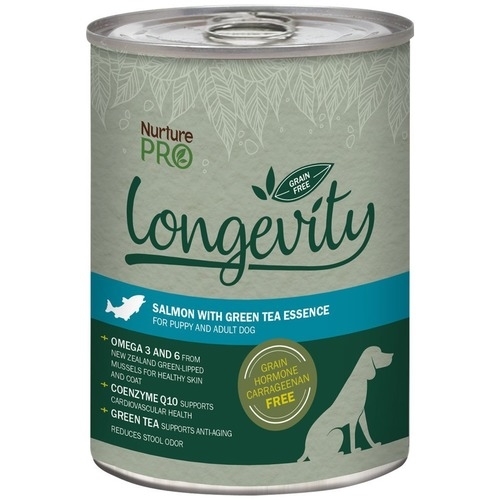 Made with fresh omega-rich New Zealand King Salmon, Longevity Salmon with Green Tea Essence contains natural sources of antioxidants and high amounts of EPA and DHA which are building blocks of a healthy brain. 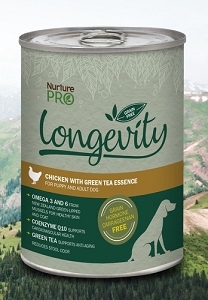 Topped with Green Lipped Mussels and naturally hypoallergenic, this poultry-free and a single-protein formula is ideal for growing maintenance and dogs with food sensitivities. 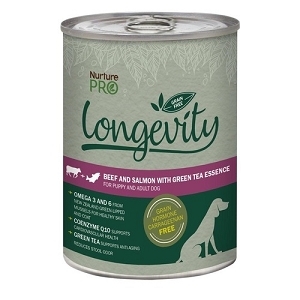 New Zealand King Salmon, Broth, Pumpkin, Ovine Plasma, Brewers Yeast, Sunflower Oil, Mussel Powder, Agar Agar, Cassia, Potassium Chloride, Vitamin A, B1, B2, B3, B5, B6, B12, Vitamin E, Iodine, Folic Acid, Biotin, Organic Copper, Organic Manganese, Organic Selenium, Organic Zinc, Organic Iron, Calcium Carbonate, Guar Gum, Green Tea Powder, Yucca Schidigera, Choline Chloride, Coenzyme Q10.